I was growing purple sweet potato for a few years but then took a break to focus more on the regular orange sweet potatoes. I miss the purple sweet potatoes and unlike the orange ones, they are harder to come by in stores. So this year I am back to growing purple sweet potato and I am taking you with me! 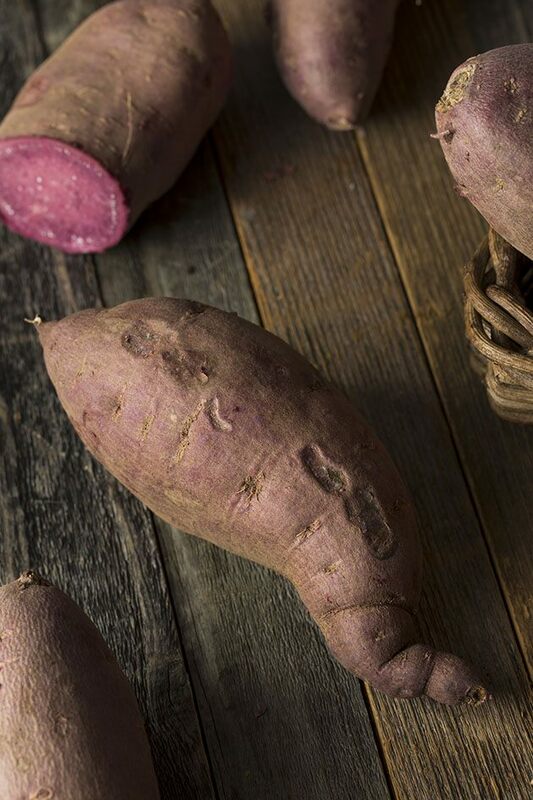 Let’s go over everything you need to know in order to grow your own purple sweet potatoes. Purple sweet potatoes are a bit different than the common orange sweet potatoes that we know so well. They have a different texture (heavier and creamier) and they are not as sweet as the orange potatoes. They are super healthy for us (more details on that later) and they are just as easy to grow as orange sweet potatoes. I got my first purple sweet potatoes at a farmer’s market years ago. I was walking around and noticed a vegetable that I hadn’t seen before. I got curious and bought a few of them. I didn’t mean to grow them, I simply wanted to taste them. I tried to sprout a regular orange potato that year to produce slips that I could plant in the garden but it didn’t work… My potato grew many roots but not one slip. Then I remembered that I had the purple sweet potatoes I had bought at the market in the pantry and decided to see if they would sprout. I placed a couple of them in jars of water and within days they sprouted and the slips started growing like crazy. That year, I ended up growing a raised bed full of purple sweet potatoes. They weren’t as sweet as the orange potatoes, but still delicious. I saved some of them, sprouted them the next spring, planted, harvested, stored… For a few years, I had a nice supply of delicious purple sweet potatoes. Okinawan Purple Sweet Potato – has a whitish skin and purple flesh. It is believed to have come to the Philippines and China area from South America around 1490. The plant reached Japan around 1600 and was initially planted in the island of Okinawa before farmers all over Japan started growing the crop. Somehow, this potato ended up in Hawaii and became an important part of Hawaiian culture. This is where it is cultivated today for the American market and therefore it’s known today as Hawaiian Purple Sweet Potato. Molokai Purple Sweet Potato – these are purple on the outside and purple on the inside and were developed on the island of Hawaii. I’ve never tried them but it sounds like they are very similar in shape and taste to the Stokes potato. Stokes Purple Sweet Potato – this variety has purple skin and a deep purple flesh. They are dense, a little dry, very very healthy, and a little less sweet than the orange potato we know. They are an American made potato, originated in Stoke County, NC, but are now grown mainly in central California. As far as I understand, a mysterious woman gave a farmer from NC some potato slips many years ago. He planted them and ended up with purple sweet potatoes. He liked them so much that he kept growing them and eventually they were registered under the name Stokes potatoes. These are the ones that I am growing. Ube – it’s important to mention this vegetable here. It looks kind of like the purple sweet potato, it’s flesh is purple but the skin a bit more on the brown side, and many people mistake it for a purple sweet potato, but the ube is actually a yam and not a potato. It is a staple in the Phillipino and Asian kitchen and you might be able to replace it for a purple sweet potato in recipes that call for ube, but it’s important that you know that it’s not the same thing. You might be able to find them in Chinese markets but even in our only Chinese market in the closest city, I couldn’t find them. Friedas sells the Stokes variety by the crate. I just bought the organic crate and I am hoping to sprout them (I received beautiful and firm potatoes in a very reasonable time and I don’t think that I paid for shipping so I definitely recommend this company). Once I do that I should be able to keep a few potatoes from my harvest every year and sprout them in the spring for the garden. Veggie Farm is based in Hawaii and sells the Okinawan Purple Sweet Potatoes. I have never ordered from them before. I also found these on Amazon but I am not sure how good they are and if they will sprout. The reviews vary. If you buy them just for eating they might be fine, but if you want to attempt to sprout the potatoes so you can grow your own, I think it would be better to buy directly from the farmer and make sure that your potatoes were not sprayed with anti-sprouting chemicals. Purple sweet potato slips – we grow sweet potatoes from vine sprouts called slips. You can choose to sprout your own potato or buy slips. I go over a few different ways to sprout your own potatoes in my post How to Plant Sweet Potatoes, so I won’t go over all that information here again. Make sure to check that post, the sprouting, and planting process of orange potatoes and purple potatoes is pretty much the same. Once your potato has sprouted you’ll cut off the slips and place them in a jar of water for a few days until you are ready to plant (if they have time to grow roots or not doesn’t matter, you can plant them even if they don’t have roots and they will quickly root in the ground). If you want to buy slips, Southern Exposure Seed Exchange sells the Stokes slips (I think that’s what they are, they don’t state a variety…) and Baker Creek Heirloom Seeds sells slips for the Molokai Purple. Prepare your soil – first of all, make sure your row or bed or container is in full sun. Purple sweet potatoes love the sun and love the heat. They are not very spoiled as far as soil requirements. A regular garden soil pH of about 6 is just fine for these potatoes. You can add compost to your bed but make sure not to add too much. Sweet potatoes don’t like soil that is too rich. Make sure you don’t add compost or fertilizer that is too rich in nitrogen. If there is too much nitrogen in your soil the vines will grow beautifully all over the place but the plant won’t form many potatoes underground. The main thing to pay attention to is that you are planting your slips in soil that is loose and drains well. We want at least 10 inches of fluffy soil. You can till the ground or use a broad fork to loosen the soil, you can build a raised row or you can plant in a raised bed. 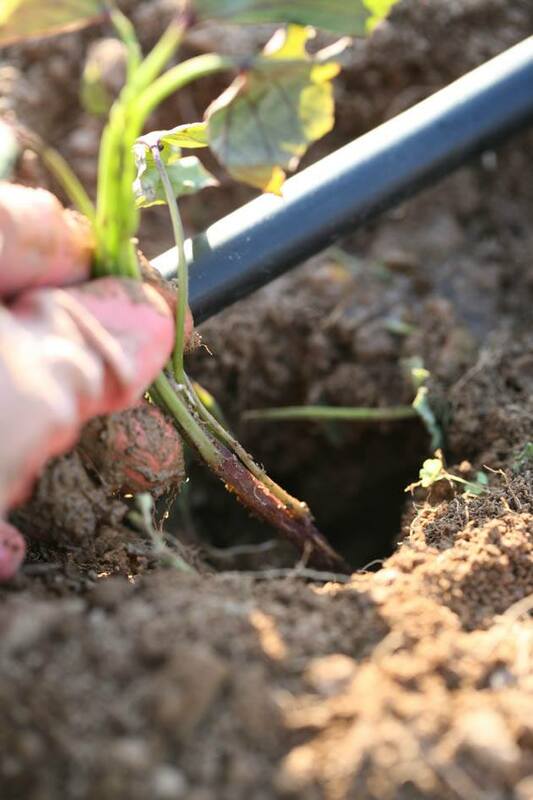 Planting purple sweet potato slips – it’s super easy to plant the slips. Dig a hole that is about 6” deep, stick the slip in there and cover. That’s it. Space your plants 12” apart and your rows 3′ apart. These vines are going to go everywhere and probably take over your walkways but feel free to trim them back a bit if you feel that they are out of control. Like with every transplanting, make sure to water well and it’s always beneficial to mulch the plants with straw to help keep the moisture around the young plants and shade them from the sun a bit. Caring for purple sweet potato plants – in the beginning, you are going to have to do a little bit of weeding but once the plant starts spreading it will cover the ground completely and there will be very little you’ll have to do. Again, you can cut it back a bit if you feel that its crawling is out of control. You should also know that you can harvest young purple sweet potato leaves and add them to your salads! They are as healthy as spinach. Pests – sweet potatoes usually don’t have pests problems. I came across two issues… First is, the rabbits and the deer love the leaves. They come by often and can eat a lot of them and damage the plant so you might want to consider a fence. If you are looking for an affordable fence idea check out this affordable deer and creature fence idea. The other pests I’ve heard about are the sweet potato weevils and wire-worms. I’ve never experienced them on my own garden but a few of my readers pointed out that they had issues with them. I think that these pests might be more common in commercial agriculture because sweet potatoes are planted in the same field year after year. In the home garden, weevils and wire-worms are generally not as common because it’s much easier for us to practice crop rotation. So make sure to never plant the same crop in the same area. If you spot the weevils on the leaves you can try spraying neem oil and if you are concerned about the weevils you’ll have to dig during the season in a couple of places and take a potato sample. However, I am not sure that during the season, if you take a sample potato and you spot wire-worms you have much to do… You’ll have to make sure to treat the soil after you harvest your potatoes and plant in a different spot the next year. Harvesting purple sweet potatoes – sweet potatoes need a long growing season, at least four or five months of good summer heat. Here in the South (I am in NC, zone 7b), I plant my sweet potatoes in the middle of May and harvest in the middle of October or towards the end of October. Sweet potatoes can’t handle a hard frost but they might benefit from a light frost. Some say that it improves their sweetness. So just make sure to harvest before the first frost date. At the end of the season, some of the vines will start flowering and after that, they’ll start yellowing. The leaves won’t be as vibrant as they used to be and that is the time to harvest your potatoes. Pull or cut the vine back and clean the top of the bed, then, you just dig! Your hands are the best tool (check out this amazing deal on the most amazing gardening gloves!). If you choose to use a shovel or a pitchfork make sure you don’t stab a potato while digging. The potato skin is very thin at this stage and any damaged potato will not store as well as a whole one. Make sure to never wash your potatoes, just brush the soil off of them gently. Curing purple sweet potatoes – after you harvest your bed of potatoes, it’s the time to cure them if you want to store them over the winter. Yes, you can cook your potato right after harvesting, nothing will happen to you, but curing makes the potatoes even sweeter and harder and they can last much longer in storage. The ideal way to cure them is in a location that can hold a temperature of 85 F and 85% humidity for about ten days. Here in the South, we sometimes have warm spells like that at the end of the growing season and we can just leave the potatoes on a table in one layer in the shed. But if you need to create this environment you can try placing your potatoes in a plastic bag and leave them in a sunny location. Storing purple sweet potatoes – after curing you can transfer your potatoes to a cardboard box. The best thing to do is to wrap each one of your potatoes with a layer of newspaper and place in the cardboard box. Then, make sure to store your box of potatoes in a cool place like a root cellar or a pantry. After six weeks or so your potatoes are now at their sweetest and you should take advantage of it and eat them! Just make sure to leave a few so you can sprout them again the next year and grow more potatoes. 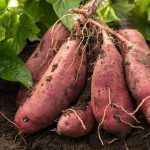 If you want to learn more about harvesting, curing, and storing sweet potatoes, my friend Amy at Tenth Acre Farm has a great article that you can check out here. When it comes to cooking purple sweet potatoes they are not much different than your regular orange potatoes. You can bake them whole in the oven or boil them in water. You can peel them, cut them, and roast them. You can make oven baked sweet potato fries or fry them in oil. Here are my roasted purple sweet potatoes that are delicious! Soon, I’ll share more recipes here on the blog. 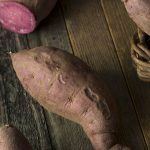 Purple sweet potato nutrition – these tubers are very healthy! Purple sweet potatoes are low in carbohydrates and fat and are a great source of fiber and vitamins like vitamin A and C.
They are also a great source for calcium and potassium, but maybe the greatest health benefit of purple sweet potato is their richness in antioxidants. 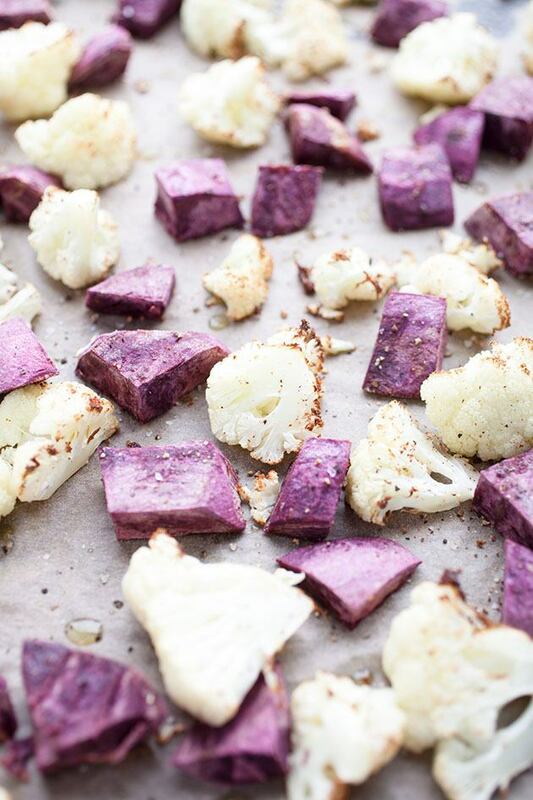 Purple sweet potato calories – of course, it’s hard to say because it depends on the size of your potato, but just to give you an idea a medium sweet potato will have somewhere around 250 calories. I hope that you are going to give purple sweet potatoes a try! 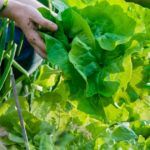 They are really easy to grow, the plants are beautiful and produce a lot of food, they are tasty and store well, and there is a lot to do with them in the kitchen. I am excited to grow them again! I’d love to hear from you. Do you grow purple sweet potatoes? Have you ever tasted one? How did you like it? Lee, did you cut your seed potatoes up or plant the whole potatoes? We always cut ours up, making sure there is an “eye” in each section cut. Welcome to NC. We live about halfway between Raleigh and Fayetteville! Oh! Thanks so much. Why didn’t I think of doing that?? I planted them whole but I guess I can actually get many more plants if I cut them like you do. great to meet you Barbara! We are practically neighbors, maybe we can meet sometime. True! Experience is everything. I wish I had an old farmer in the family I could consult with, but it seems like I’ll have to figure it out by myself, Which is fun too so no complains. Maybe If one of my kids end up as a homesteader, I’ll be able to be the “old wise farmer” to them… We’ll wait and see. I’m growing Purple Sweet Potatoes in my backyard here in Melbourne, FL. They have been in the ground since late April, so I’m thinking I should dig up one plant to see if they are mature enough to harvest. How long were you going to leave yours in the ground? I heard the rule was 120 frost free days. BTW – the plants thrive here and have done their best to take over everything. The rabbits are happy – they love the leaves and stems. I’m not happy with the rabbits. HA! I am not too happy with the rabbits either but those potato plants do crawl all over the place and I read that you actually supposed to cut them back a bit so most of the energy go to the potato and not into making new vines, so maybe the rabbits are not so bad after all. I also heard that they need 4 hot month in the ground, like you said. I am planing to dig mine the second week of September. I did plant a bit late so I hope it is not too early but I need to plant the bed for winter. I am very curious to see what’s under the soil. Thanks for visiting! Please come back to let me know how yours turned out. Don’t forget to cure the potatoes for two weeks. It will be hard to wait, but it has to be done. I’m thinking of digging up one mound tomorrow just to see how they are doing. I’ve read that Florida has a worm in the ground that makes growing any sweet potato here a bit of a challenge. I’m currious to see if I have realistic expectations of a harvest next month. Yes, it will be hard to wait. Also, with my regular potatoes I wasn’t gentle enough and when I dug them out the skin was so thin and moist that it peeled off. So this time I have to remember to really be gentle. I did a test dig on one mound yesterday. Unfortunately there were no potatoes, not one. All I have grown are roots and long invasive vines. I think I know what I did wrong though – and that was to plant the slips that became plants in 5-gallon buckets I kept alive through the winter rather than starting new slips from the plants. Lesson learned – will try again next year. In the meantime, my 12 lbs of purple sweet potatoes from Hawaii will be delivered today. If I can’t grow them, then I’ll buy them. So you think that the plants were just too big when you moved them from the buckets to the ground? Were those slips you started last year? I’m surprised to find someone plant purple sweet potato in the US. I live in Tennessee, the climate is quite close to NC. I tried to start some purple sweet potato this spring, using the same method as yours. But nothing happend, no sprouting, even no rotting. It was a tough potato sitting on the water jar for weeks. I don’t know if there was something wrong with the purple sweet potato I bought from Asian grocery store, the regular sweet potato sprouted in a few days. I harvested my potatoes last week. Getting ready to post about it this weekend. Hopefully I will have the post with photos and all by tomorrow. I did not harvest as much as I hopped for, but for something I just experienced with for the first time I did ok. I would recommend to try and grow the kind of potatoes you find in your farmers market, this way you know it’s the right kind for your area. But I know it is fun to try new things sometimes. Come back to check my harvest post! Do not buy grocery store sweet potatoes because they are sprayed with anti growth chemical to keep them from sprouting! Only buy organic sweet potatoes, that is the only way you will get good slips. I paid as much as $260 per pound to get good potato stock. Try Whole Foods or an organic farm if you are looking for organic sweet potatoes. Oops, I meant $2.60 per pound not $260. I live in Massachusetts where the growing season is quite short. I started 10 sweet potatoes last winter in my kitchen by soaking them in pans of water. They sprouted slips by late April. June first I planted the whole potatoes and did not remove the slips. The potato vines spread all over the place until late October when the frost killed the plants. That is when I dug them up which took three full days. These sweet potatoes were very aggressive growers, they throw many sucker roots which grew small, medium to large potatoes as far as 15 feet from the main plant. Some grew as deep as 3 feet which is strange because we have heavy clay soil. We harvested about 100 pounds of sweet potato. The original sweet potatoes did not rot, but double in size. They now look the size of small melons which we are keeping for next years crop. It is strange that the offspring sweet potatoes are bright red in color and the parent potato is tan. We put the parent potatoes and most of the small potatoes in pots with potting soil and now four weeks later they are beautiful house plants for the winter. Wow! What a success. Do you know what kind of sweet potatoes you grew? And did you plant them in clay? They ARE very aggressive growers, it took me a while to get rid of all the vines. Everything left in the bed after I harvested, even the smaller piece of plant started rooting right away. I might try to grow them in a different area of my garden in clay soil, if it worked for you it might work here too. This will free my good-soil raised bed for some other summer crop. And next year I might try to leave them in the ground until the frost kills the plant. Thanks so much for sharing your experience, and for visiting. I do not know what kind of sweet potato they are and I planted them in rototilled clay soil. I am digging and sifting an area that is 10 x 40 feet by 3 feet deep to mix the clay top soil with the gravel under soil for next years potato crop. I picked up 5 more varieties of organic sweet potato ranging from dark purple, red, and white. I started them 5 days ago in potting soil and they are already sprouting. I hope to harvest over a 1000 pounds from next years crop. It sound like a lot, but we eat a lot of food over time. They make great sweet potato fries and potato chips. I wonder if some of the potato roots will over winter outside if planted deep below the frost line? I did place some at 2 feet and some at 3 feet, which I will check in the spring. So, are you starting next year’s potatoes indoors already? Then in the Spring just plant the whole vine with the potato it rooted from? I got organic sweet potatoes from the farmer’s market a couple of week ago, but meant to start growing slips from them in February. I am wondering if I should start now… I am going to try to work another section of my garden for next year’s potatoes. We have red clay here I’ll try to mix it with compost. Normally I wouldn’t attempt to grow anything in it, but the sweet potatoes are real aggressive so maybe they can handle it. Let me know if the vines you planted 2 and 3 feet deep survived. I have started the already as an experiment. I want to cut long potato slips into 2 foot strip next April and get them to root. I want to plant hundreds of rooted potato slips and the mother potatoes with some slips still attached. To start potatoes I prefer to use damp potting soil rather than the water method as you have shown. It is a lot less work and much less smelly. Interesting update, when preparing sweet potato for meal time, cut the pointy ends of the sweet potato off and place them in damp potting soil. They seem to spout roots in just days. My house is going to be over run with potato vines this winter. One of the sweet potatoes that I planted in a pot is already climbing half way up a window curtain and seems to be growing 4 inches a day. It looks like Lee is no longer growing purple sweet potatoes. Are you still growing them? I was just thinking about going back and updating this post since google seems to like this page when it comes to purple sweet potatoes. No, I am not growing them this year. I currently have around 300 ft of regular, orange sweet potatoes. The purples are great, and you grow them pretty much the same way as you will grow the more common verity, the only difference is that the orange ones are sweeter. I am working on a post about how to grow sweet potatoes so stay tuned. I want to take as many pictures as I can of all stages so it might take a while. Yesterday I decided it was finally time to clear all the Purple Sweet Potato vines growing in my garden and just be done with them for the year. To my surprise I harvested over 30 lbs of beautiful potatoes from just two parent plants. Some of them were quite large. I learned that every place the vine roamed and put down roots, I would find at least two or three potatoes underneath. None were more than a foot deep with most being just at the surface. So now they cure for two weeks and we will see how they taste. With this unexpected success (remember my test dig in late summer), I made sure to save plenty of slips to start a new crop this spring. How exciting! I guess they just needed more time maybe…. I opened a new area in my garden just for sweet potatoes, last year it was a nightmare to try to clean my bed from the vines. But I am not sure if I can just leave mine in the ground like you do because our winter is much colder than the FL winter. Some people say the frost will damage the potatoes some say it wont. I will have to try. Yesterday I put a couple of covington sweet potatoes in a jar with water to try and sprout them. If those do good in my garden this year I will save the vines like you do for next year instead of starting all over again from a new potato (thanks for the tip!). Also, I am going to try the seed tapes you suggested. Already made carrot, lettuce,and few other tapes. Hopefully, it will save me some work. Hi All, I was reading your post. Very interested. I live in Bettendorf, Iowa. I would like to grow the purple sweet potatoes here in Iowa. Any one can tell me where to buy purple sweet potatoes? I don’t know where online you can find the purple sweet potato that I grew last season but I have a couple small purple potatoes that I can send to you if you like. One of them is already sprouting. You will have to email me your address. You can find the Hawaiian purple potatoes for sale here: http://www.hawaiiveggiefarm.com/ They supposed to be even tastier than the orange one we get at the store. Hi Lee, Thank you very much for the reply. Thank you for willing to send me your potatoes. My husband went to a local Asia store, and to his surprise they had about 10 LB of purple sweet potatoes. I was so glad and ask him bought 5 lb. It was so nice to know I will be able to get it next week. The store will have it every week. That is so nice. I still like to grow them in my yard if I could. Just put 2 of them into the container which has water. A similar way like the pictures you have shown in this posting. Like to see how long will it take to grew roots. No problem, Julie. Glad you found them. After you harvest every year, keep some of the vines in a water jar for next season, this way you don’t have to sprout them again every year (it takes a long time for them to sprout…). Good luck! Hi Lee; Great idea. I didn’t know what. Is that means if I cut off some vines, put it into the jar, they will grow? I have a friend in Orlando, FL and she has a very small yard and have some purple sweet potatoes growing at her yard. That means, I could ask her to give me a few vines? She was going to dig some potatoes to let me try how nice it is. I didn’t want to take her sweet potatoes, since she has so little. I think she would not mind a few vines, may be. It is funny with sweet potatoes… It takes so much time to make them sprout, and half of them don’t even sprout, but then when you have vines you can’t kill those things! Those are VERY aggressive plants. Cut a few, lets say about 8 inches long, and place them in a water jar. They will grow roots within a couple of days. They will grow and grow until they take over your house 🙂 They look great actually, very nice house plants. The vines won’t grow potatoes if they are in water, just roots. Then next season plant those vines in the garden and you’ll get potatoes. When you harvest at the end of the season, keep few vines for next year in a water jar and so on. This way you’ll never have to sprout them again. If you live close to your friend just pick up a few vines, if you don’t she will have to wrap them in moist paper towel and overnight them to you. You will get them wilted but they will come back to life once you put them in water. Make sure you keep them inside the house in a warm place, they don’t like cold. Thanks for sharing your knowledge. My friend cut a few vines and put it into water. Only 2 days, she could see a few tiny roots forming. It was fun and she was very glad. Looks like I will get a few vines from her. Yep, they take off really fast. I hope you’ll get great harvest. Send me a photo if you remember. Thanks for sharing my site with her. I also gave her your website too. Hi, do you sell purple sweet potatoes for plant seed? I do not have any at the moment. I will probably have some at the end of the growing season after I harvest my plants. I will keep your email and let you know later this fall. I dug up what i thought were purple sweet potatoes that my father planted. He’s now in a nursing home and has dementia, and doesnt remember them, however, i planted a few at my place and the vines have gone crazy. they are running up the fence and getting flowers. the flowers develop into massive purple beans. Does anyone know if theyre edible? can i plant the seeds in the beans) and grow more potatoes??? I tried to look for an answer for that but can find anything about those beans you are talking about. I never get to this stage because I harvest my potatoes once they start bloom. I say, try planting them and see what happens. I know for sure the leaves of the sweet potatoes are edible, but again, couldn’t find anything about the beans. Let me know if you find anything. Hi Lee, we grow purple sweet potato pretty regularly around here in Hilo, Hawaii. However, I am just growing my first batch. I also tried to sprout a potato in water, and it rotted! Maybe I had the wrong end, too. So I bought two plants at our local walmart. I don’t know how they will react when I put them in the ground, but we’ll see. I know that I am starting them kind of early (I will be putting them in the ground next weekend), but we’ve had the weirdest winter here, and its been pretty warm during the day. I’ll let you know how it goes. And since your last post is a few months old, update us! I Just bought a box of Hawaiian purple potatoes a month ago. I am trying to start them in water, but so far only one germinated. It is still too cold here in NC to plant sweet potatoes, I hope I’ll have enough slips by May. Is it warm enough to plant sweet potatoes now in Hawaii? Definitely let me know how it goes. Thanks for stopping by! Great article and info on growing your own sweet potatoes. I am looking forward to seeing your harvesting blog….which I will be reading next. I’m in the Piedmont area of NC in a city by the name of Hickory between Statesville and Morganton. Welcome to you and your beautiful family. I have read several times about growing the purple sweet potatoes. Am confused. Hope you can help me understand better. you are saying when the potato begins to sprout, do not plant that end? I’ve grown a few white potatoes years ago and it was the eyes we planted. But white potatoes are a different character altogether. So I soak one end of the sweet potato in water as described in your photos, when it sprouts, that is not the end to plant? You are taking cut pieces from somewhere to plant – from the end without roots? So how did you get the vines with roots you grew in jars? And then is it these you planted in the garden? as you can see, I really do not understand. You are right, white potatoes and sweet potatoes are completely different. With white potatoes, you sprout them and then plant the sprouted potato. With sweet potatoes, you place them in a jar of water, so one end of the potato is in the water and the other is not (like you see in the pictures). The end that is in the water will start to grow roots. But this is not what you plant in the garden. You wait, and wait, until the end of the potato that is not in the water starts to grow vines. 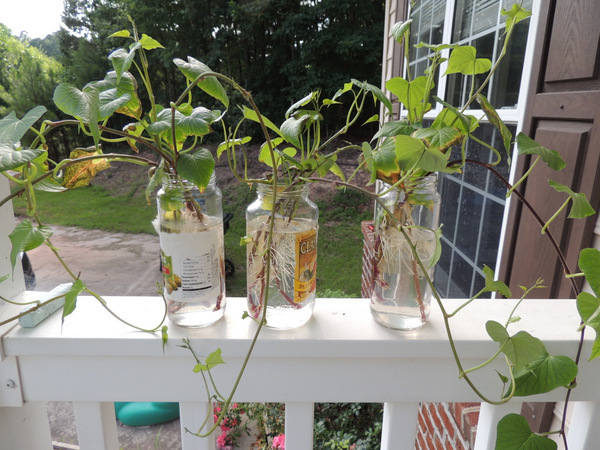 When the vines are about 8 inches tall, you cut them at their base (where they are connected to the potato),and place them in a jar of water. What will happen is that the vines will start growing roots. When the roots are about an inch long you can plant the rooting vines in the garden. Those are called sweet potato slips, and if you don’t want to do all this by yourself (it takes a couple of months), you can buy slips from almost any seed company. I hope this helps, if not, don’t hesitate to ask. I guess I should not have put all my internet addresses on that message. Please consider removing them. You are welcome Roxy. Here in NC, we plant sweet potatoes at the beginning of May so it will be a good idea to start working on growing slips soon. It takes a few months. Good luck! Do you know any nurseries in England that sell purple sweet potato slips to get me started? I buy purple sweet potatoes at a supermarket, how would I be able to use them for planting in my garden in Surrey (SE England)? I don’t know any nurseries in England, but you can sprout the potatoes you buy at the store (will work better if they are organic). Place them in a jar of water with half the potato sticking out of the water. Then you just wait. Change the water every few days and after a few weeks they will sprout and start growing slips. When the slips are 8” tall, cut them at the base and put them in water, they will grow roots very fast. You plant those in your garden. Keep in mind that sweet potatoes need around 5 months of hot weather. Here in NC, I plant them in the middle of May and harvest in the middle of October. Thank you for your web site and for the advice that you have given, regarding purple sweet potatoes. In SE England, it may not be hot enough weather (for 5 months!) to grow sweet potatoes. Next year I will try to do so, as there is a lead in time of about 2 to 3 months work before planting the slips in soil in May. Come back to let me know if it was a success. Good luck and thanks for stopping by! I read your article and was intrigued that sweet potatoes and regular potatoes grow in such a different way. I am wanting to grow purple sweet potatoes in Michigan and not sure where to get them. Do you currently have any ‘slips’ to sell or where you might recommend? Unfortunately, I don’t have any slips to sell. I got my purple sweet potatoes from a local farmer at the farmer’s market and sprouted the potatoes myself. They weren’t as sweet as the orange sweet potatoes so I now grow the orange ones instead (I get slips from Johnny’s Selected Seeds). 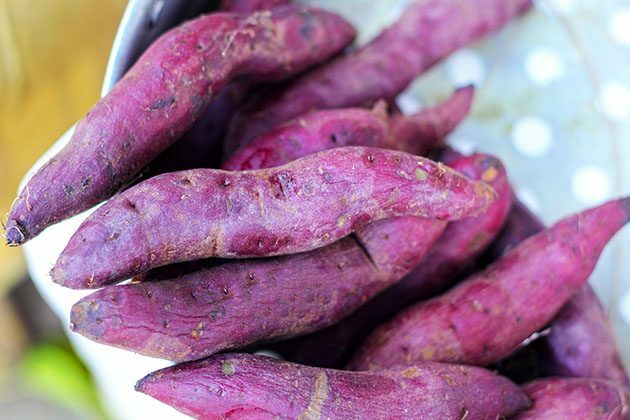 I found this site, https://sowtrueseed.com/product/all-purple-organic/, that sells purple sweet potatoes slips. I never bought from them but if you can’t find purple potatoes at your local market you might want to try ordering potatoes or slips online. Good luck! Lee, we bought organic purple sweet potatoes at a local grocery chain, planted them inside under a grow light in pots in dirt, them dug them up when it was time for outdoor planting. We cut each stem off with a little of the sweet potato itself and they grew madly in the garden outside in a sandy soil. However, and this is what I hope someone can help me with, the roots (or tubers, whatever you call the part under the soil that you harvest and eat) all had many little white worms inside them. I don’t believe they were wire worms either. How do we grow them without this happening? It is so disheartening to spend all that money, time and energy on them and them get a bad crop. There are little (1/4 to 1/3 inch long) whitish worms all in them! Help! It would have been a great crop without the worms. I suppose we’ll cut them up and feed them to the chickens. If they are not wire worms they might be cucumber beetle worms or flea worms. All those three will feed on sweet potatoes. If you want to stay organic it might not be easy to get rid of them. First, plant your potatoes in a different spot next year. Then, I will turn the chickens loose in that spot where the potatoes were so they can, hopefully, clean the area for you. You can also try to mix diatomaceous earth in the soil and make sure you don’t leave any potatoes there. If there is no food the worms won’t have a reason to stay there. Another option is to grow a catch crop. You plant some potatoes in that spot to keep the worms occupied and plant your real crop somewhere else. Those are organic option, of course, you can always spray. Also remember, your main goal in the garden is to build soil. If your soil is sandy you have to add organic matter to it. Lots and lots of compost. If the soil is not healthy it invites many problems. Also, keep in mind that you can always grow sweet potatoes in containers.